October | 2017 | LIT.GAZ. If you think about it, the Dark Materials trilogy is a self-contained work that cannot itself be added to or extended: the events of those novels span multiple universes, made possible by the operations of Lord Asriel, and also by the use of the subtle knife, and when the novels end, the doors between the universes must all be sealed up, and the knife broken, so no further movement between worlds is possible: this is what makes the separation of Will and Lyra at the end of The Amber Spyglass so moving and painful – as well as necessary. 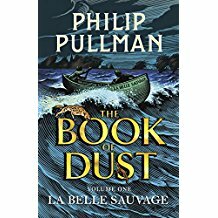 So, any subsequent books, including La Belle Sauvage and whatever the second and third parts of The Book of Dust is to be called, are additions: La Belle Sauvage happens in Lyra’s world, which we all know and love, but does not extend outside of it. The machinations of the Church, and Asriel, and others researching the Rusakov particle, will lead to the fantastic events of the trilogy ten years later, and the ten years after those events, the following books may be set in Will’s or Lyra’s world (or both) I imagine, but without connection between them. What these limitations leave Philip Pullman with, it seems to me, are his ideas, which for me were always at the heart of the Dark Materials trilogy anyway: questions of innocence and experience, the notion of good and evil, original sin, and the role of God, if there is one. The world of the Church and the Magisterium is a cruel and Calvinistic one, it seems to me, and its evil has been clarified for me by some of the reading I’ve been doing lately that has been prompted by the 500th anniversary of Luther‘s ninety-five theses and the start of the Reformation. One of the things which came from the Reformation was a stronger emphasis on what can only be called predestination: the idea that, in religious terms, or if one accepts that particular Christian doctrine, most people are born with no hope of salvation, doomed to damnation, and the small (smug?) band of the elect, or the saved, are saved through no effort of their own. Obviously I oversimplify, but it’s a pretty cruel God that some people have invented, and one that my own Catholic upbringing makes me find repellent. The idea that we must try to build the Republic of Heaven here and now, in the world we are actually living in, is not a new one, though Pullman has made it clear and concrete in a different way in HDM. The choice to rebel against an arbitrary power (God, if you like) was evil, wrong, Satan-prompted, in traditional Christian terms, although even Milton in his epic Paradise Lost cannot help turning Satan into some kind of hero. But Pullman emphasises that the choice to reject control, to assume power oneself, is a positive and liberating one, as well as being the one that makes us fully human; again, it’s this final point that Milton cannot avoid in his poem. So, ultimately, is this choice to be human wrong – a sin – or inevitable, given our free will, and also liberating: this is what we are, and can be? Back to Pullman, who nails his colours clearly to the mast in HDM: the Fall was a felix culpa, but not in the traditional Christian sense: the Fall liberates us to be human. Will and Lyra made many choices, considered and with the help and advice of many wise creatures, on their epic journey. 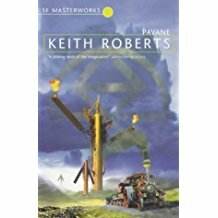 Having read and enjoyed La Belle Sauvage, but thought further some of its inevitable limitations, I now realise that it’s the next two books that I’m really waiting for: what did happen next? We are into well-crafted plot fairly rapidly, and I was amazed to realise how quickly and easily I slipped back into the parallel universe that is the one of the original trilogy: it seems quite ‘normal’, if that makes sense. I’ve always liked the way that Pullman ‘makes it strange’ in a Brechtian sense so that we notice the differences sufficiently, not to be oblivious to them, and yet we are not in so strange a world that we cannot easily connect it with our own. Although the plot is instantly gripping, I was aware that Pullman is piggy-backing his new story onto our memories of what went before (strictly, after, I suppose…). Characters re-appear, different because younger, and in different roles and this, of course, fired up my desire to go back again to HDM. And, most interesting of all, we are back with real philosophical questions, about the nature of consciousness itself, and how it developed in humans, and how far it extends down the chain of being and matter: we are back with Dust, and original sin, and innocence and experience. Pullman is an ace story-teller on one level, and on another, he really makes his readers work: if you only get an easy read out of this, you have missed so much. As with HDM, there is the shock for adults of realising that children can sometimes know and understand more than we do, precisely because of their innocence. And Pullman does not pass up an opportunity to emphasise the liberating power of reading and libraries to children either, a note which always resonates with this particular reader. I found myself thinking at one point, ‘well, it’s just more of the same old formula’ and then told myself that that was exactly what I wanted: more of that world, those people, those questions… Pullman has said that this novel is darker than the trilogy, and it is – there is more evil, and yet I was also struck by a strong sense of a network of good people with good intentions, doing their best in a difficult world, a feeling that I think is reinforced by the links with characters we met in different situations previously; it’s also a valuable message for us in our own benighted real world: there are a lot of people striving to do good, succeeding, and making real, small differences. The second half of the book is set against the backdrop of a calamitous flood affecting all of southern Brytain, perhaps an acknowledgement of climate change most obviously, but one which reminded me very strongly, in terms of Pullman’s descriptive powers, of some of the more hallucinatory sections of Coleridge’s Rime of the Ancient Mariner. I shall have to look more closely into this one. In short, an excellent read which gave me a very happy and satisfying sofa day, and briefly sated my desire for more of the world of His Dark Materials. I hope I haven’t spoiled it for you: get on and enjoy it yourself! I’d been familiar with the idea that, until the early Middle Ages, reading had not been a silent activity, that is that a person when reading would vocalise what s/he was reading, either silently or aloud (which of course slows the reading process down considerably), and that it had been a revelation when it was discovered that this vocalisation was not necessary – one could ‘just’ read, as it were, just as we do now… and children, of course, need to learn this, or realise this, or perhaps they just pick it up. Anyway, to me the processes of reading and writing had always gone hand-in-hand; I’ve never separated the two, particularly as, in my experience, we learn to do them at the same time, in the early years of our schooling. I’d never thought any further about this until I came across the idea that a person might be able to read, but not be able to write, and it took me a long time to make sense of this. It was carefully explained to me that there are various different ways of teaching children to read, some of which lend themselves to learning to write rather more easily than others. And then, there are a whole range of fine motor skills and also secretarial skills involved in the process of writing, which also have to be learnt, and might not be. And then there is the whole question of sentences. We do not tend to speak in sentences: a transcript of any conversation will demonstrate this. So the units of meaning necessary to writing also have to be taught and learned. Not only does a child need to learn to write in sentences – something which, from my experience as a teacher, a good many never do with any great competence – they also need to work out how to articulate their ideas into sentences before they attempt to write them down. And this is pretty difficult, as primary teachers will testify. Once I understood this, I realised how the two processes, which are clearly very different, could have been separate from each other in the past: it’s only current educational systems that have linked them together, for convenience’ sake. And then: what does a person actually need to write? If you are a person of any note or importance and cannot write, you can have someone who will do that for you. People in India still make their living as public scribes for those who cannot write, but may occasionally need something written out for them. Perhaps you only need to write lists, or figures. You may need to make a mark to authenticate a document. But do you have a need to write in sentences? And to learn all that complicated stuff? I’ve often wondered why there hasn’t been that much progress in ‘speak-write’ technology (even Orwell had it working perfectly in the Ministry of Truth in Nineteen Eighty-four), and I can see that apart from removing the need for any keyboard skills at all, it will not advance the work of a non-writer any further than we have currently progressed. I suppose those experiences were useful in terms of teaching me about different viewpoints; they certainly got me interested in what could have caused such major ructions at the heart of Christianity. I’m still learning, and there’s an excellent explanation of the doctrine of justification by faith alone in this week’s edition of The Tablet. My travels have taught me how different the Reformation was in Germany compared with England; in Germany there seems to have been much more of a continuation than a violent rupture; no mass iconoclasm such as destroyed so many cultural riches in England. I continue to be appalled by the vandalism and wanton destruction of Henry VIII’s reign. There are three writers who I’￼​ve found very helpful in developing knowledge and understanding of the religious issues and historical events. One is a Catholic priest who wrote in the 1950s, Philip Hughes, who wrote a short volume on the Reformation in general, and a second, monumental tome, The Reformation in England, which details the demolition of Catholic England. 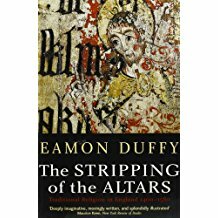 Then there is Eamon Duffy, who has written works of socio-religious history which trace the actual effects of the English Reformation on its people in two detailed and astonishingly well-researched books, The Stripping of the Altars, and The Voices of Morebath. 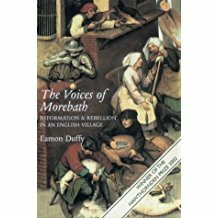 This second volume looks at the changes as they affected on small rural community over the years between the first breach with Rome and the Elizabethan settlement. 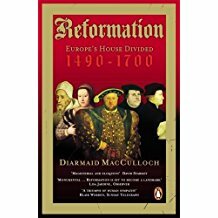 Finally there is Diarmaid MacCulloch, whose hefty tome Reformation came out in 2003, and which I have decided to revisit as we come up to that symbolic 500th anniversary. I’ll write more about his book when I’ve finished it. A curious novel – Q – was published a decade or so, apparently written by an Italian collective who presented themselves as one Luther Blissett. It focuses on the social upheavals in Europe during the early years of the Reformation particularly the Anabaptists and the events in Munster, along with the early efforts of Rome to thwart what was going on. Finally, I can’t overlook the astonishing religious poetry of my favourite poet, John Donne, a man genuinely torn by the religious strife in England and the theological controversies – although he ultimately knew which side his bread was buttered on. He brings to his Holy Sonnets and other poems the same ardour he brought to his sexual conquests and fantasies in his love lyrics, before he ‘saw the light’, took holy orders in the Church of England and went on to become Dean of St Paul’s and a man whose sermons people came from all over Europe to hear. Not much likelihood of similar fervour nowadays. Well, this makes Kafka read like Winnie-the-Pooh! I’ve long been a fan of the Albanian writer Ismail Kadare, who I think should have received the Nobel Prize in Literature years ago; I’ve read a good number of his novels, and though they do vary in quality, they never fail to grip, or to disturb. I’ve had a fascination with Albania for years, too, and hope to go there one day. Kadare’s novels are inevitably heavily overshadowed by the rather insane world of the dictatorship of Enver Hoxha, the intrigues by which he retained power, and the political disagreements during which he fell out with Yugoslavia, the Soviet Union and eventually the Chinese, totally isolating his small Balkan nation from the rest of the world. The premise of this novel is extremely far-fetched, and yet Kadare subtly makes it credible: the Secret Police, having introduced a new range of ultra-sensitive listening devices, believe they have captured information from a spirit, specifically the ghost of a dead man, buried three years previously, with a concealed microphone still on his body; it concerns, of course, an imperialist plot against Albania and the Guide. Careful framing of the story in three nested sections helps create plausibility, and the lengthy central section involves seances and political intrigues, and among other things we learn that a prisoner who died in prison could have his sentence extended in the cemetery before his relatives were finally allowed to collect the corpse… An expert on Albania would be able to tell how much of Kadare’s narrative is pure satire and how much reflects the reality of that paranoid nation; what comes across very effectively is the craziness of how far the tentacles of the state extend and how far those in power are prepared to go in order to to remain there. And I don’t think for a moment that it’s only old-style communist states that operate in that manner. The vagueness of the opening – a mysterious commission, after the fall of communism, is attempting to clarify what went on at the time of the plot, then shifts to the main story, and the loose ends are definitely not cleared up in the final section, so that the reader’s knowledge and understanding of events is constantly shifting and uncertain, and at times we are sucked into the utter paranoia of the secret state and its victims: just as you think nothing can possibly become any weirder, it does. Hallucinatory would be a good word to describe this novel. It wasn’t an easy read; I did at one point wonder if I’d bother to see it through, but then – I don’t quite know how or when – I was utterly gripped: how insane can this become, I wondered? Daniel Defoe‘s novel The Adventures of Robinson Crusoe is generally acknowledged to have been the first novel in English. Published in 1719, it is based on and inspired by the sojourn of a Scots sailor and buccaneer, Alexander Selkirk, who spent four years voluntarily marooned on the island of Juan Fernandez, off the coast of Chile. Defoe was also a journalist, and certainly succeeded in making his fictions appear to be factual, as did many writers in those early days of the novel, when this new form was gradually being developed and its potential discovered. A Journal of the Plague Year reads convincingly as an account by someone who lived through the London events of 1665, yet Defoe had not even been born in that year. And Jonathan Swift went out of his way in 1726 to try and lend verisimilitude to the far more outlandish Gulliver’s Travels. It’s clear that Defoe would have had access to accounts of Selkirk’s stay on the island, which is quite sketchy, but mentioned many of the things that Defoe was skilfully to develop and enhance: the need for shelter, how to feed and clothe himself, fear of strangers landing on the island and capturing him – though, of course, Defoe makes the strangers savages and cannibals rather than mere French or Spanish sailors – and the comfort brought to a solitary man by his faith in God. Defoe’s hero remains on the island for far longer, and is assisted by the shipwreck which provides him with all sorts of useful supplies and equipment that Selkirk never enjoyed; his stay on the island lasts over twenty years, and he eventually gains the companionship of the faithful Friday… you can see how a novelist puts his imagination to good use with his source material.